Seen at Hampton, Virginia in a photo taken in August of 1976 is fleet # 334 - a 1947 Mack Model C-45-GT operating for PENTRAN (Peninsula District Transportation Commission and now Hampton Roads Transit) but probably originally purchased by Citizens Rapid Transit Company of Newport News, Virginia. # 334's most visible oddity is a well placed and neatly designed after market Thermo-King roof top air conditioner condenser unit with interior duct work - very common among Virginia's fleets of both Mack and GM equipment prior to 1960. Second, and less noticeable, is a small fresh air intake cut into the right rear corner of the body at the belt line which became necessary when # 334's gasoline power plant was converted to Diesel. All and all, I would say that # 334 doesn't look too bad in its 29th. year of service! 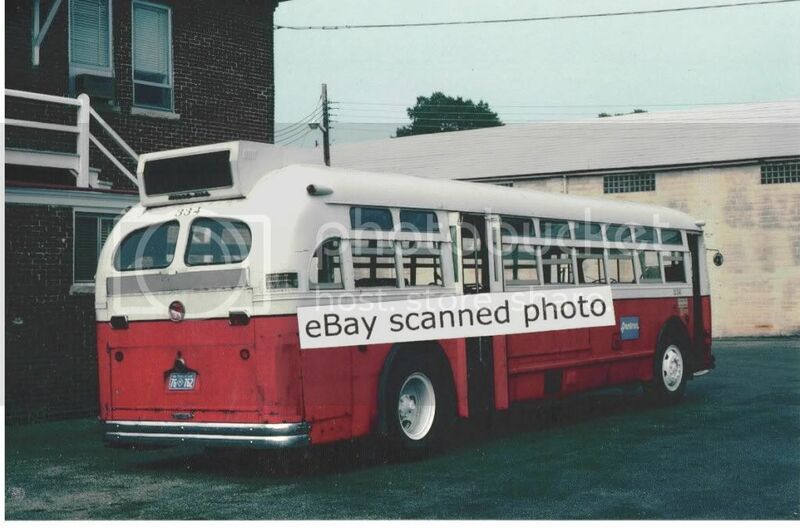 Photo courtesy of 4509bus and is up for bid on eBay as item # 350581331224. I wouldn't classify this as an oddity, even though the angle of the front wheels do look a bit odd. Post war Macks have the reputation for it's tight radius steering and the angle of the front wheels on this bus gives it an illusion that it's on casters. 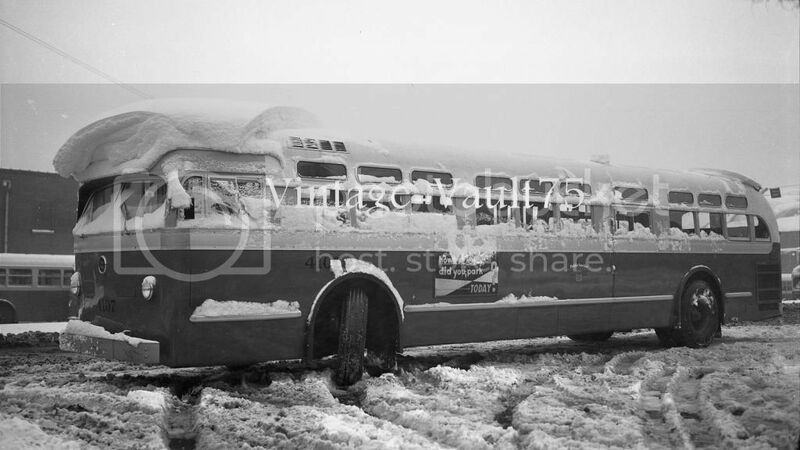 This is SLPS Mack C-50-DT #4107 posing after a rare heavy St. Louis snow, one of 25 ordered in 1951 and numbered 4100-4124. Many operators years ago found special need for very short buses but still with heavy duty characteristics to accommodate unusual routes with sharp turns and steep hills and, while bus manufacturers did offer low capacity models, their power trains usually didn't equal the specific tasks required which led many properties to call upon their own shops and the ingenuity of their craftsmen to remake their own equipment. 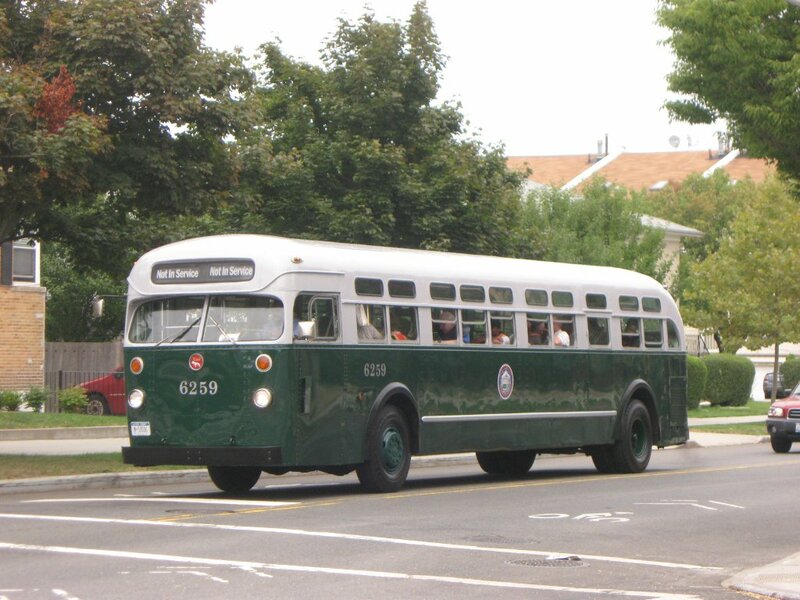 Pictured below is fleet number 2617 - a 1960 Mack originally built as a 40 foot long 102 inch wide Model C-49-DT and one of 450 delivered to San Francisco Municipal Railway (MUNI) in increments between 1955 and 1960 (actually, the largest single order in Mack's history). Now, a compact 27 passenger power house with its original Diesel plant, #2617 is seen coursing the # 39 Coit line in shuttle service between Fisherman's Wharf and the famous Coit Tower atop Telegraph Hill. To augment the service, one other C-49 numbered 2359 (ex 2657) was also reworked. Of note on #2617 is the single openable transom just forward of the rear door and the disk shaped appendages on the roof which may have to do with a ventilation system. It is believed that one or both of these buses have been preserved. 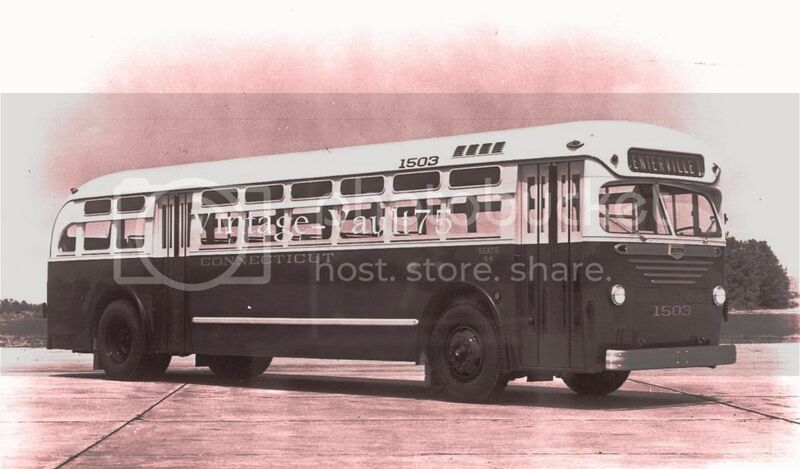 Photo, taken in 1974, thanks to Jim Husing of NorCal Bus Fans. 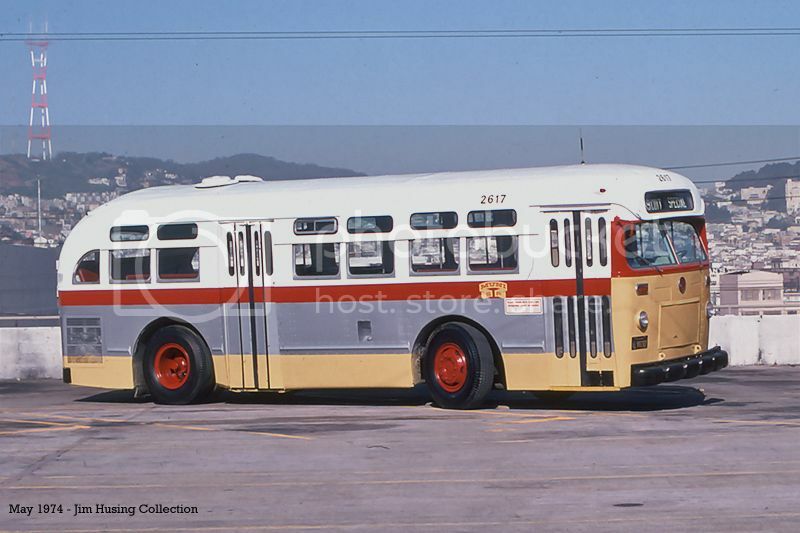 As of 1975-76 39-Coit wyed at Montgomery and Union in mid-street before heading back to Coit Tower. The cutdown Macks replaced three elderly White 784s dating from 1938. Whites 060 and 062 have been preserved. The turn around at the top of Coit Tower has a tight radius with a statue in the center which precluded operating 35 or 40 foot buses. The 39-Coit is now served by 30' Orion VII hybrids, purchased in 2007 to replace Orion Is. The front overhang appears to be standard C-49DT, based on photos I have. Shortening the length of the bus accentuates how long it looks, I'm sure. 6000-6317 C-49 Macks 99 3/4"
4500-4899 TDH 5101 GM 98 1/4"
Actually, the long forward overhang on MUNI Mack #2617 gave it the intended or unintended consequence of a very short wheelbase which worked perfectly especially around the Coit Tower. I've been up there many times and wondered how a 35 or 40 foot bus could possibly have navigated that terrain. The Motor Coach Age issue on Mack (March-April 1974) states that the standard C-49 specs placed weight on the rear axle that was in excess of California PUC regulations. Mack moved the front axle back 15 inches. The San Francisco, Greyhound (C-49DM), two for Terminal Island and the SF demo (sold to Terminal Island) had the short wheelbase. Looking forward to the photo! In the meantime, here's 3 Youtube clips showing the same theme - long overhangs vs. steep hills! You may need to copy & paste. The time is the beginning for each scene. First clip: 2:18 (both buses), 8:30, 8:52 (descending bus), 9:30 & 10:26. 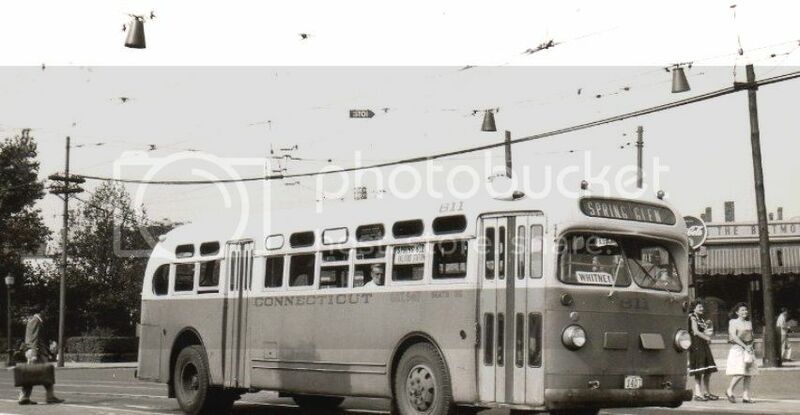 Seen in upper image at its coming out party in Allentown, Pa. is fleet # 1503 - a 1951 45 passenger Mack Model C-45-DT and one of twenty likenesses numbered 1500 to 1519 delivered to the Connecticut Company of New Haven, Connecticut in that year. There is nothing outrageously odd about #1503 except for a set of small factory installed lights with one to each side of the destination sign. This was not uncommon on virtually all of Connecticut's equipment as can be seen in the lower image of a company Yellow Coach Model TG 3606 #'d 811 and, while I have made numerous inquiries about the lamps, which incidentally were blue, I have never really gotten a definite answer (perhaps one of our Connecticut colleagues will enlighten us). While the company favored GM products in the post war era, they did dabble in Mack with 119 purchased between 1947 and 1958 comprised of 30 C-37-GT's, 44 C-41-GT's and 45 C-45-DT's. #1503's roll sign happened to be set for Centerville - a suburb of New Haven. Upper photo courtesy of 'Vintage-Vault75' and is available at eBay as item # 171146380088.